Recently I traveled solo to Paradise Island in the Bahamas to exhibit at an accounting conference. Tough duty, I know. But someone's got to do it, so it might as well be me. 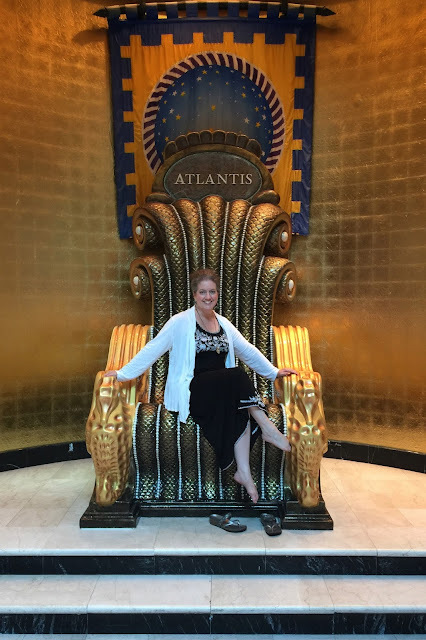 All kidding aside, it has been a difficult year full of trials and tribulations, and if you follow our sisters' blog, you will have noticed the abrupt change in blogging status since January. A one week getaway is exactly what I needed even though my time away from home would not technically be a vacation. I had one ticket to paradise and I would surely make the most of my non-working hours. And so it was, just as I had hoped, that after a week of embracing 'island time', and letting the stress flow away from my body, I was ready to get back to my 'real' life. I committed to myself that I would try to hang on to island time for as long as possible after my return. The Royal Towers features the Bridge Suite, one the world's most expensive guest rooms at $25,000.00 a night. I particularly liked the the sea horses as architectural accents. On a Friday morning in Tucson I rose at 3:00 a.m. to start my travel day. Fourteen hours passed before I reached my final destination. It seemed as if everyone on the final leg, the flight from Atlanta to Nassau was headed to the conference. I had a nice chat with the accountant sitting next to me, Pete from Northern California, a quiet, professional elderly gentleman was looking forward to the days ahead partaking of educational courses and networking with peers and exhibitors. The next time I bumped into Pete it was at a vendor sponsored party at the resort's nightclub, Aura. Free booze flowed like a river for three hours. In a room full of accountants, there was much speculation over the sum of the bar tab. The three co-hosts surely gained a lot of American Express points that night. 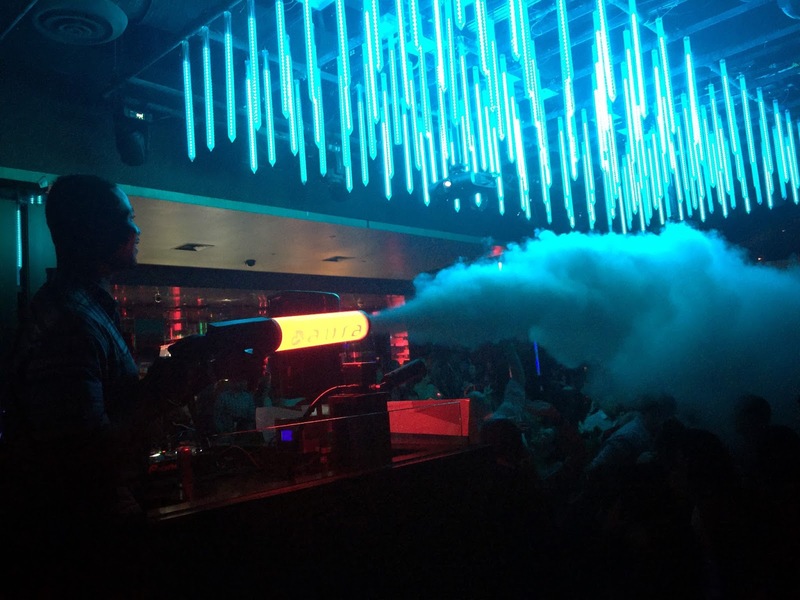 The DJ shoots fog over the dance floor. As Austin Powers would giddily say, "Yeah, baby, yeah!." 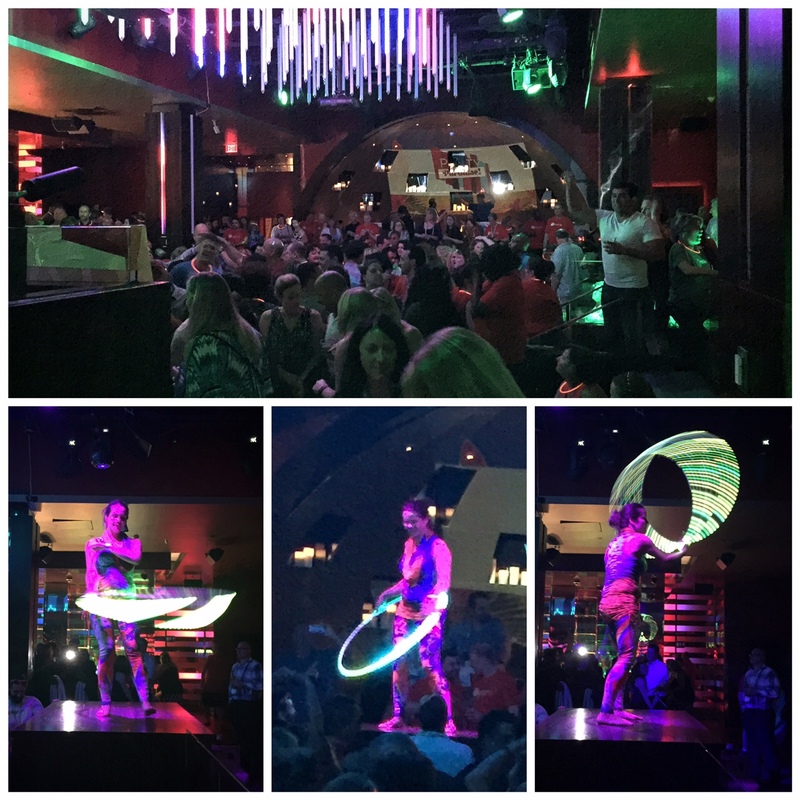 My friend Kaydee hooping at the confrence's after-hours party hosted at the nightclub, Aura. The time was approaching ten o'clock, and the party had been raging for two hours. Pete's gray hair was disheveled, his shirt untucked, and he was three sheets to the wind. Amazingly, he was still on his feet, walking nonetheless, and had a silly grin on his face. When he saw me slowly passing him, his unfocused eyes suddenly zeroed in on my face in recognition. Pete stopped walking, which stopped the flow of human traffic behind him. I nodded my head at him, as if to say without words, "Hey there!" Pete grabbed my shoulders to stop my forward motion. He then proceeded to plant a big kiss on my cheek. I was thankful that his lips were dry. He staggered. I grabbed his waist, steadying him. As a potential future customer, I gamely smiled, patted his shoulder once I was sure he was once again somewhat balanced on his feet. Mom-style I advised him to be careful, wiped my cheek for good measure, then continued weaving through the maze of people who were idly popping some moves while gazing down upon the gyrating bodies that were getting their groove on the sunken dance floor. The blaring dance beats bounced off the walls and ricocheted across the night club. The laser lights zigged, then zagged. The strobe lights flashed. I was instantly twenty-two again when the DJ spun a set of 80's music. We whooped, we hollered, we danced, we had fun. I didn't see Pete again. 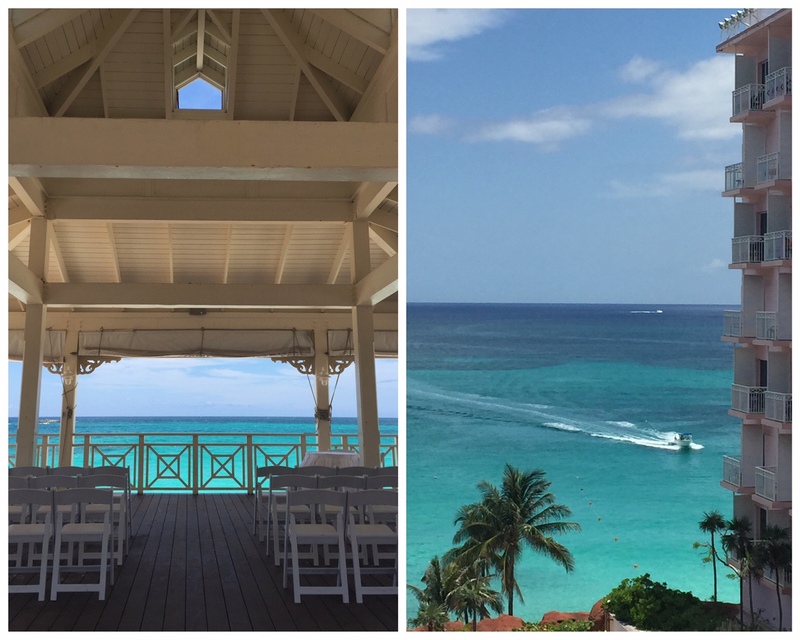 Weddings are held in the beach-side cabana that overlooks the aquamarine waters of the ocean. 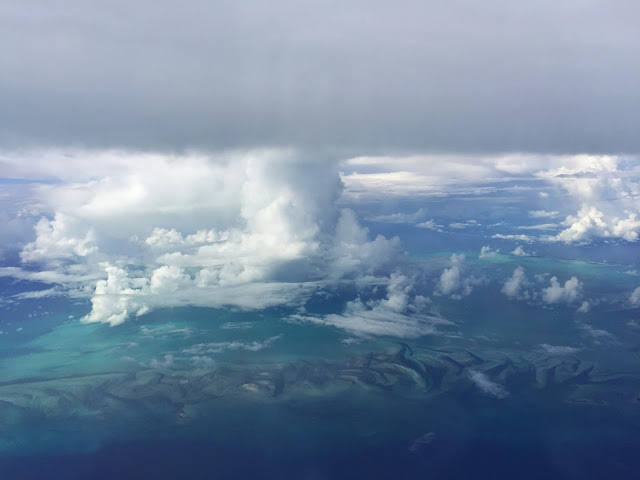 I learned from a friendly marine biologist that was seated next to me on my return trip home that the Bahamas is home to the second largest barrier reef in the Northern Hemisphere. While checking-in I learned begrudgingly that I was assigned a garden view room. That would simply not do. C'mon, I'm on an island. I live in the desert. I want to gaze at the beautiful turquoise ocean as much as possible, even if it is for a limited time everyday. Upon my not-so-subtle prompting, the registration representative noticed that I was staying an entire week. A view of the ocean was definitely in order, we both agreed. The friendly Bahamanian pulled some strings to help a mama out. After a ten minute walk from the registration desk in the Coral Tower lobby to my Beach Tower room, I stood poised to slip my card key into the lock when I heard the air conditioning vent bellowing like a freight train on the other side of the closed door. I knew I wouldn't be able to sleep with that racket. As I opened the door, the light from the hallway illuminated the darkened room in a dim glow, I could see that even in the low light that the room was unkempt and obviously needed maid service. The bed had been slept in, the covers were thrown back, the top sheet looked like a crashing wave tumbling over the shore of the wrinkled comforter. A quick glance at the bathroom yielded a view of used towels piled on the bathroom floor. Because it was 9:30 at night, I thought the perhaps the room might be occupied. Regardless of the state of the room, I went to the window and pulled back the closed curtain and sure enough, there was indeed an angled view of the ocean from the deck. The Queen of Atlantis holds court. Back downstairs I went, thankful that I wasn't dragging my overstuffed luggage behind me. God bless bellmen. I politely informed the lone employee who stood behind the concierge desk about the state of the room and the bellowing of the air conditioning vent. The young woman, who seemed to be on a word fast, tipped her braided head to peer at a computer screen and began tap-tap-tapping on a keyboard, clearly with the intention of assigning me a new room. Once again I felt trepidation over being on the receiving end of a garden view room. Hesitant to interrupt, but doing so anyway, I kindly shared my desire for an ocean view with the stoic woman. Without making eye contact, the concierge simply nodded her head and continued to stare at the computer screen without saying a word. I did my best to be patient. I'm sure she's tired of hearing the same tired request over and over again. Oh well, I thought, hope for the best and see how the situation unfolds. I learned later during the week that my experience was not unique. Many attendees that I spoke with at the tradeshow had changed rooms not once, but twice due to varying problems with the air conditioning and plumbing. The incredible view from my room in the Beach Tower, which I was grateful for everyday. For the second time that night, I entered a darkened room in the Beach Tower. The first thing I noticed was that air vent whispered cold air into the room. Silence is golden. I flicked on the lights. The beds were precisely made, the closet was empty and the white towels in the bathroom hung appropriately in place. The washcloths looked like splayed peacock feathers and were placed decoratively inside carefully folded hand towels. Once again I pulled back the closed curtain that covered the sliding glass door. To my delight, through the glass I could see by the moonlight that the view from this room was better than the room before. Before me was a magnificent view of a pool and beyond the pool and unencumbered view of expansive ocean. I opened the glass door and heard the waves rolling over the sand. In the end, for a little hassle, and a nice concierge that didn't seem so nice while she was reassigning my room, I wound up with exactly what I desired. The room itself was fine, nothing to write home about, overall the hotel looked a little tired, but at least is was clean and had an amazing view. I called to ask the bellman to deliver my bags and then I had just enough time to grab a slice of pizza topped with jerk chicken and sliced banana peppers before the take out joint closed at eleven o'clock. 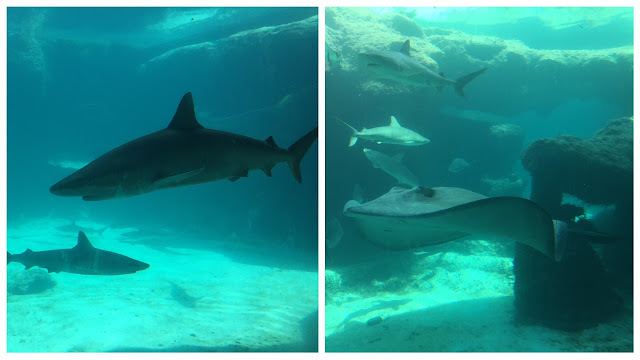 I learned it's not so easy capturing photos of the active sea life in the lagoons and aquariums. 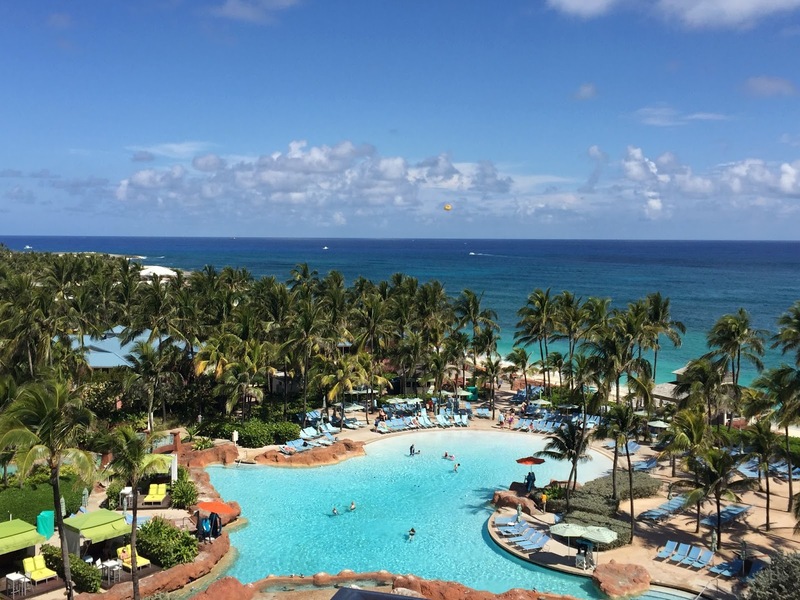 To illustrate the size of Atlantis, the water park alone is built on 143 acres. Between the three towers—Beach, Coral and Royal—and the condo-hotel, The Cove, there are over 3,000 rooms. 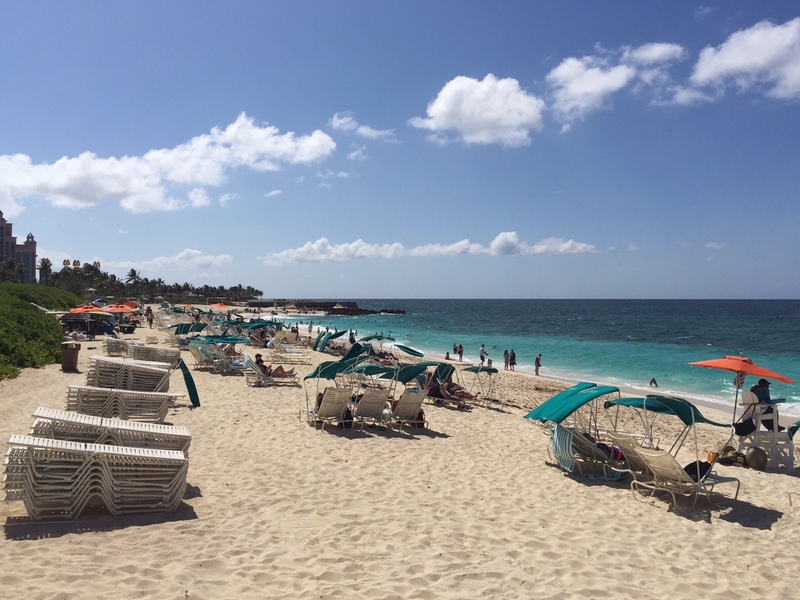 In addition to the pools, slides, and both fresh water and salt water lagoons, there is a two mile stretch of beautiful beach, the sand soft and white. The shallow ocean water is luminous clear green before mutating into dark blue in the deeper depths. I could clearly see the interplay of colors from my vantage point of my ocean view room. 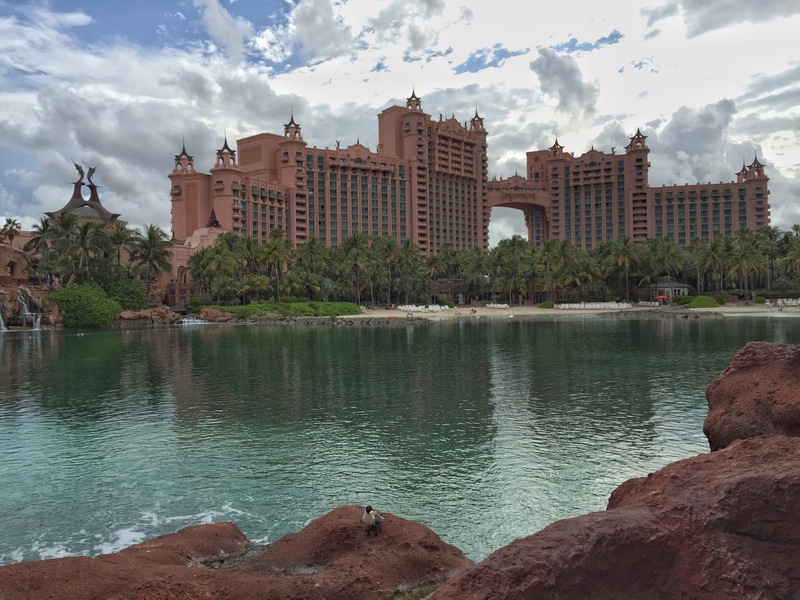 My friend, Monica, said that staying at Atlantis is like staying on a docked cruise ship. The experience is much the same. Atlantis is all there is on Paradise Island. You can take an excursion into town, but the round-trip shuttle ride just seems like a big pain in the neck. A view of Paradise Lagoon. The Beach Towers are in the center and the Coral Towers on the right. My favorite outdoor bar on the property sits under the cover of the seashell covered roof. 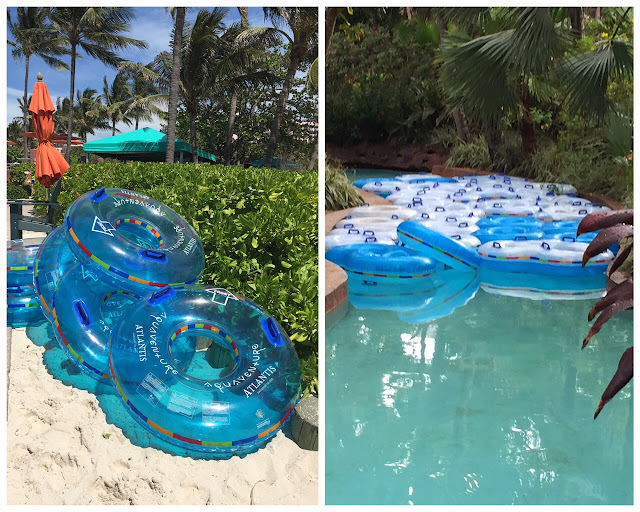 A favorite water attraction is tubing along the mile-long lazy river. 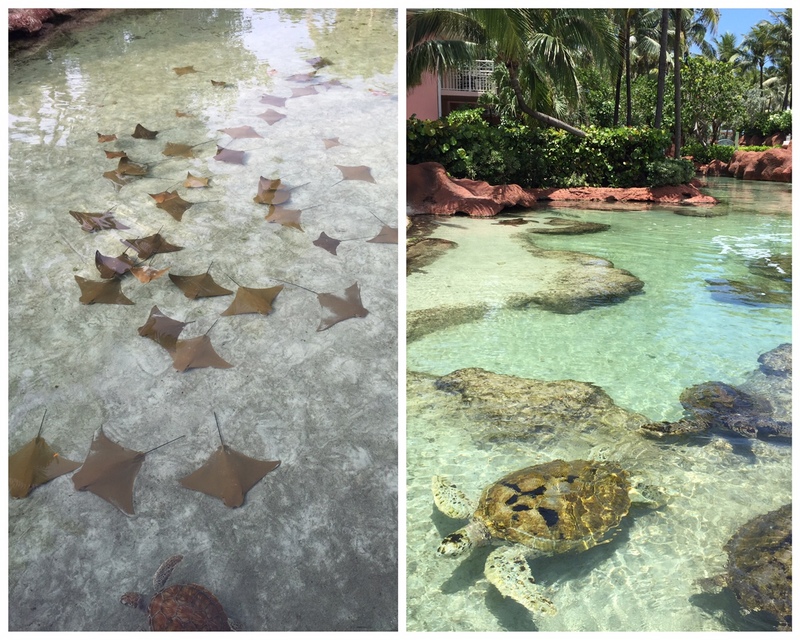 I enjoyed my time in the Bahamas. Mainly, I think, because I was by myself. Kate, a colleague from New Zealand was my booth buddy for the tradeshow. Kate had her own room and we maintained our own schedules unless we were working, or meeting in the late afternoons or early evenings for cocktails and then dinner. That was ideal. I could rise in the mornings, put a hat on my head and walk the seven minutes to the Coral Tower to order coffee and a croissant at Starbucks. I'd bring breakfast back to my room and sit on the deck, looking out over the pool and ocean like a Queen surveying her kingdom while sipping a venti latté and slipping flaky bites of croissant into my mouth. While I enjoyed my morning respite, the staff below worked at a steady, unencumbered pace while cleaning the pools, arranging deck chairs and feeding the sea life in the surrounding lagoons. 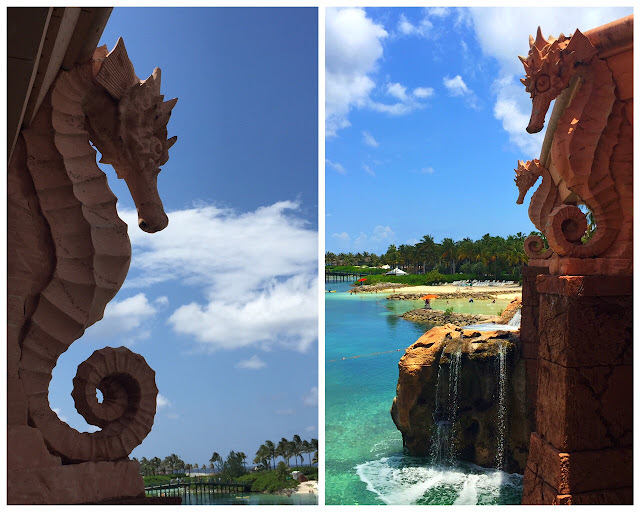 A stairway leading to the Predator tunnel is located below the Lagoon Bar & Grill. The Lagoon Bar and Grill is surrounded by a lagoon filled with sharks. I noticed some sharks at the bar, too. 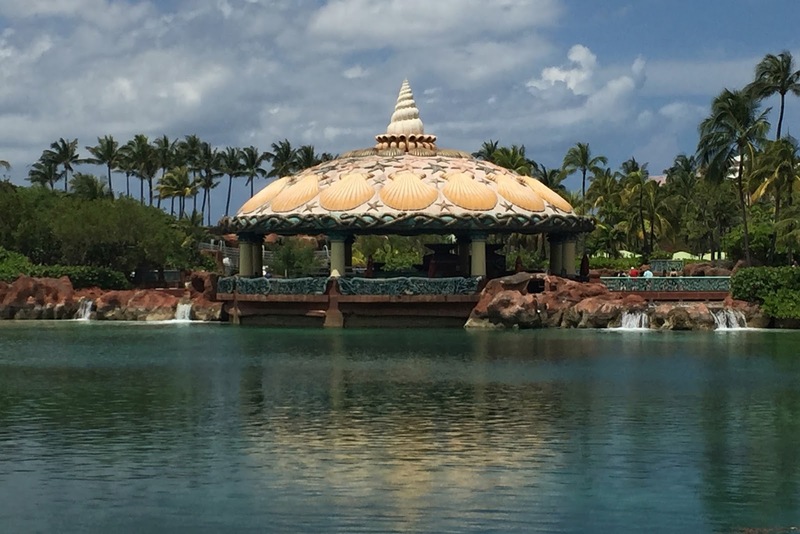 I overheard plenty of couples quarreling in paradise over the course of the week. I thought, more than a handful of times, I'm glad that's not me. I have no one here to stress me out. No one I have to consider but myself and, of course, Kate. I did as I pleased. I ordered a Bahama Mama cocktail the size of my head and drank it down without guilt. I joyfully ate a croissant every day. I ate nachos slathered in pulled pork and doused with melted cheese. In between working hours, I wore sleeveless, flowing tank tops and didn't care if my arms looked fat. I did what I wanted, ate what I wanted, slept when I wanted. I came home to Tucson feeling relaxed. The question that loomed was how long the feeling would last. When I finally worked up the nerve to stand on the scale (I just couldn't help myself), I discovered that I lost nearly two pounds. That couldn't be right, I thought to myself. I weighed myself again, but the scale was consistent. I was consistently surprised. Twice over. The departing view of the Bahamas from my seat at approximately 20,000 feet. On the way back home, I shopped the duty free shop at the Nassau airport. I looked at the prices listed for the various rums, whiskeys and scotchs and frankly the prices at my local Costco seemed better. I was about to exit the shop when I spotted a bottle of Nassau Royal Liqueur, which is a key ingredient in a Bahama Mama. I suspected that this particular liqueur would be difficult to source in Tucson, so I bought it and stuffed it with some difficulty into my computer bag. It felt like the weight of the roller bag doubled. Although I felt like a pack-mule, dragging that bag around, I'm glad I brought the bottle home. 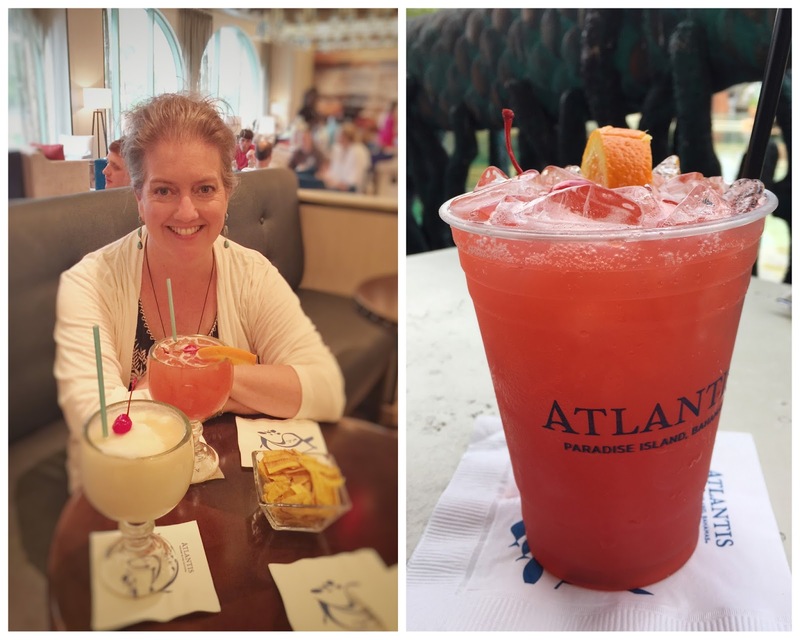 In the days following my return home, just as I could feel island time slipping away from me, I thought what better way to pretend we're in paradise, then to make a signature drink from the Bahamas. I gamely whipped up a gallon of Bahama Mamas for a family dinner over Memorial Day and they were a hit. By the end of the evening, there was nary a teaspoon left in the bottom of the pitcher. The fruity libation perfectly complemented Fallin' Off the Bone Baby Back Ribs and spicy chicken wings. Slurp down a Bahama Mama and you'll surely feel yourself slip into island time, too. No plane ticket required. 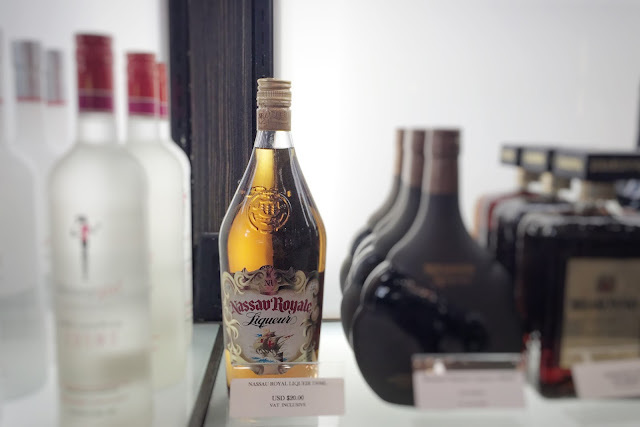 Nassau Royal Liqueur tastes of vanilla and spice. Without the liqueur the cocktail would taste like a fruity kid's punch. The more complex flavor profile with the addition of vanilla and spice is especially nice. The Liqueur can be purchased on-line. After a hard day's work, it's happy hour for Kate and me. Kate ordered a Piña Colada. 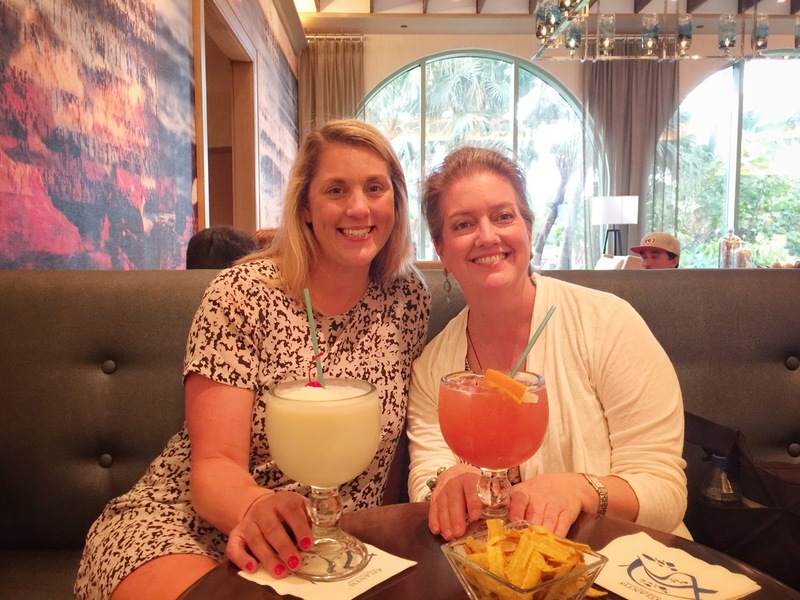 My sister, Linda remarked that the Bahama Mama is as big as my head. 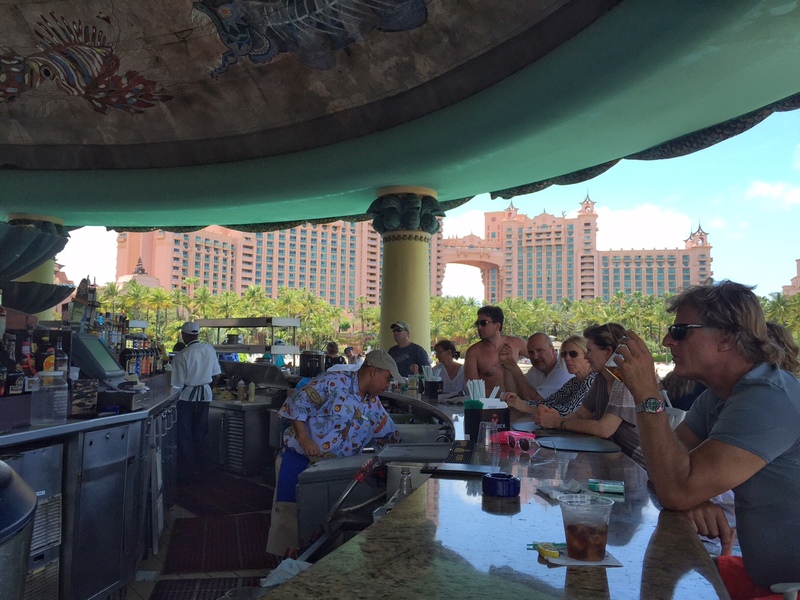 Even at Atlantis, where I ordered Bahama Mamas at two locations, the ingredients list varied slightly. This drink is on the sweet side, so you could very well choose to add a portion of Malibu rum, if you like the flavor of coconut. Recipes that added banana liqueur I shied away from because I don't particularly care for the taste of banana liqueur, and it wasn't included in the Bahama Mama's that I ordered at Atlantis. 1. Mix all the ingredients together in a large container (I used a Cambro). Cover and chill. Serve individual portions over ice. 1. Put all the ingredients in a shaker. Shake well and pour into a glass filled with ice. Garnish with an orange slice and a maraschino cherry, if you please. 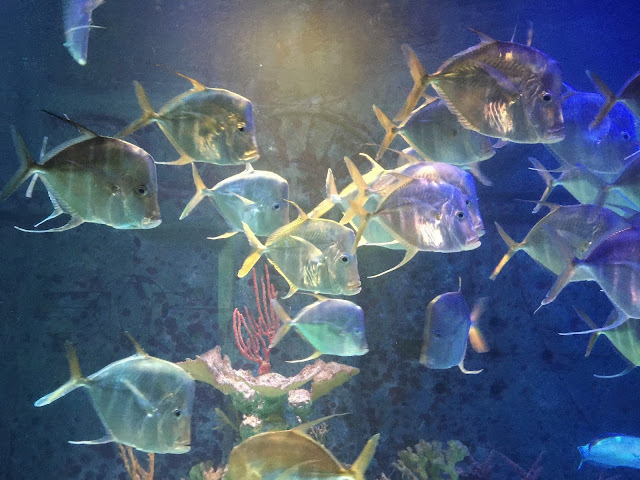 I made sure to visit the various aquariums located across the property on a daily basis.